Philip Dey (Phil) Eastman was an American screenwriter, children's author, and illustrator. As an author, he is known primarily as P. D. Eastman. Eastman was born in Amherst, Massachusetts to Clarence Willis and Ann Hull (Dey) Eastman. After studying at Phillips Academy, Andover, and Williston Academy, he graduated from Amherst College in 1933 and later from the National Academy of Design in New York City. From 1936 to 1941, Eastman worked at Walt Disney Productions in assistant animation, story-sketch, and production design. From 1941 to 1942, he worked in the story department of Leon Schlesinger Productions, Warner Brothers's cartoon unit, and was a member of Local Number Eight Hundred And Thirty-Nine of Motion Picture Screen Cartoonists, the trade union to which cartoonists belonged in the United States. In 1942, Eastman was inducted into the Army. He was assigned to the Signal Corps Film Unit which was headed by Theodor Geisel, who later became known as Dr. Seuss. Here, Eastman conducted picture planning for animated sequences in orientation and training films, and he also wrote scripts and drew storyboards for the Private Snafu series for Army-Navy Screen Magazine. From 1945 to 1952, Eastman worked at United Productions of America (UPA). He was a writer and storyboard artist for the Mr. Magoo series. Eastman and Bill Scott co-wrote the screenplay for the animated comedy Gerald McBoing-Boing, which won an Oscar for Best Animated Short Subject in 1951. Eastman also directed educational films and worked on the Flight Safety series for the Bureau of Aeronautics, U.S.N. while at UPA. Eastman was a protégé and colleague of Theodor Geisel by the time that Geisel had begun using the pen name of Dr. Seuss. He wrote many books for children in his own distinct style under the Dr. Seuss brand of Random House, many of which were in the Beginner Books series. Eastman was a member of the American Civil Liberties Union, Westport Artists, the Screen Cartoonists Guild, and the Audubon Society. Eastman was married in 1941 to Mary Louise Whitham of Glendale, California. He had two sons, Alan Eastman and Peter Anthony (Tony) Eastman, an animator, who himself directed video adaptations of Richard Scarry's children's books. 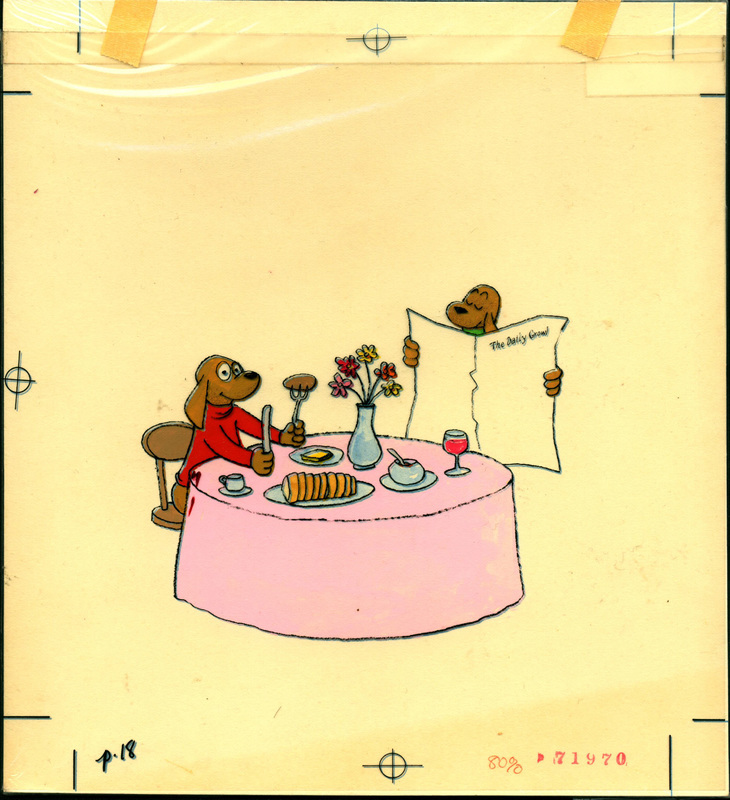 Peter has also written and illustrated Fred and Ted Go Camping (2005), Fred and Ted Like to Fly (2007), and Fred and Ted's Road Trip (2011), and contributed new illustrations to several reissues of his father's books, The Alphabet Book (2000), Big Dog... Little Dog (2003), Red Stop! Green Go! (2004), and The Cat in the Hat Beginner Book Dictionary (2007). Celluloid and paint (tempera?) and ink? Philip Dey (Phil) Eastman, “The Daily Growl,” Westport Public Schools Digital Collections, accessed April 25, 2019, https://collections.westportps.org/items/show/1916.